This is the caliber I’m thinking of when someone asks me “what gun should I buy now that I’ve got a Concealed Carry permit?” 380 ACP is less effective than a 38 Special snubnose but it is still powerful enough to offer good bullet expansion and acceptable penetration depths in the target. Once a person starts to carry a concealed firearm, they will notice that firearm very quickly due to the weight and size. Modern pocket guns are typically either chambered for 32 ACP or 380 ACP. Naturally, the larger the caliber the larger the gun will be. 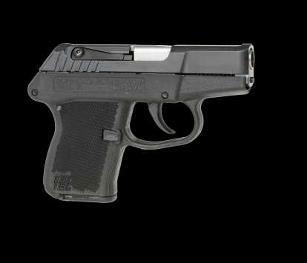 But most 380 ACP pocket guns are truly small enough to fit in your pocket and remain visually undetectable in most cases. What is ironic is that it was the 380 ACP that first involved me in ballistics testing. If I were a member of any group, it would be the “Show Me” group. At the time I had purchased a Kel-Tec P3AT for CCW. The gun was reliable and the price was right. Previous to that I carried a Kel-Tec P32. When I bought the 380 ACP, I realized “hey, I don’t know why I bought this” - because I didn’t know if the 32 ACP actually had met my needs for terminal performance or not. The next step I took was to search the internet for “the Best 380 ACP for SD” or something similar. The recommendations I read, though well-meaning, lacked any basis in experimental reality. Show Me. Many conflicting recommendations based on nothing and backed by nothing led me to invest the money in the ballistic gelatin manufacturing and testing equipment. Brief email assistance from Dr. Martin Fackler and the fantastic wound ballistics resource of FirearmsTactical.com created by Shawn Dodson set me on my way to making and testing ballistic gelatin. It was then that I discovered the significant ammunition performance differences between ammunition from different manufacturers. These differences are even further noticeable when you shoot the same ammunition out of different manufacturers guns and different barrel lengths. Add in barrier materials in front of the block such as winter clothing and you will see how involved proper ballistics testing is. If a person is contemplating carrying their gun for self-defense, they are counting on the ammunition to function and keep them from great bodily harm. For hunters, the subject is important because choosing the right bullet increases the chance of scoring a humane and effective shot on a game animal. The 380 ACP is a marginal caliber for self-defense. Bullets shot from mouseguns with 2.8” barrel lengths usually either expand well and don’t penetrate to the 12.0” preferred depth or don’t expand at all and penetrate far beyond the 12.0” preferred depth, wasting wounding potential. The barrel thickness and quality of machining also play a role in how fast the bullet will be launched out of your barrel. Pocket guns are typically optimized for weight reduction and mechanical strength. I strongly recommend that you test your firearm and a few different brands of ammunition for expansion using wetpack newspaper, ballistic gelatin or water jugs if that is what is available. 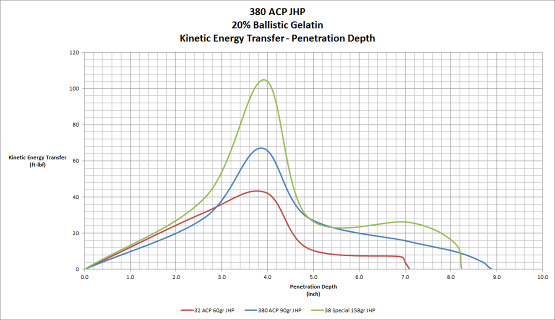 The plot at left demonstrates visually the difference in kinetic energy transferred to a target when struck by 32 ACP JHPs, 380 ACP JHPs and 38 Special JHPs. What is important is to realize that even an optimal bullet is still on the low end of the terminal ballistics spectrum and that multiple shots are usually required even when larger caliber handguns are involved. It may be a good idea to ‘stagger’ the types of projectile in your 380 ACP firearm. What I mean by this is to load (say) a JHP that expands well and lacks penetration first in the magazine and then follow this round with a FMJ (to increase penetration at the expense of wounding ability) and so on. Practice is essential with any type of equipment that you expect to use correctly in a stressful situation. Smaller guns are harder to shoot and as such, they require more practice than larger guns. Increase your safety by routine practice with your self-defense firearm.